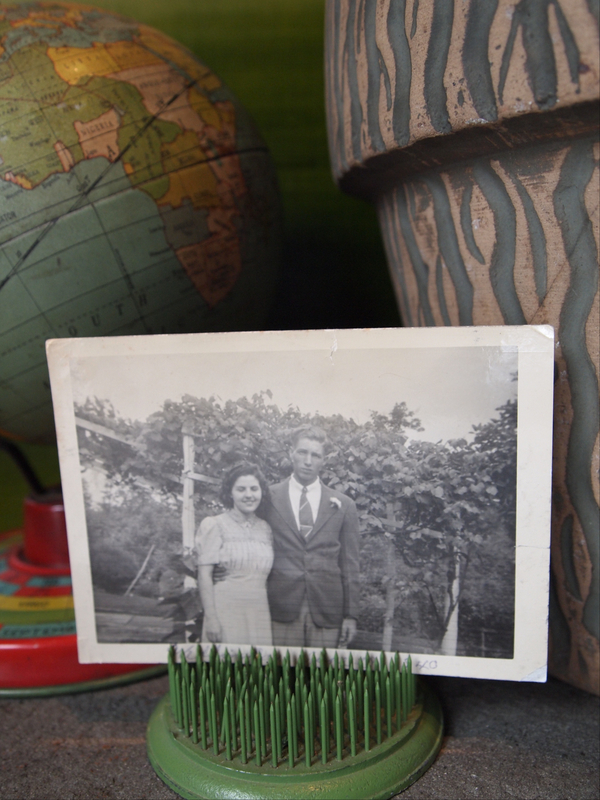 Since I like to collect stuff, each month I’m going to do a blog titled, you guessed it, ‘A Few Of My Favorite Things.’ And, within these posts, I’ll share a little project or two (or three) you can do to repurpose your ‘Favorite Things’. 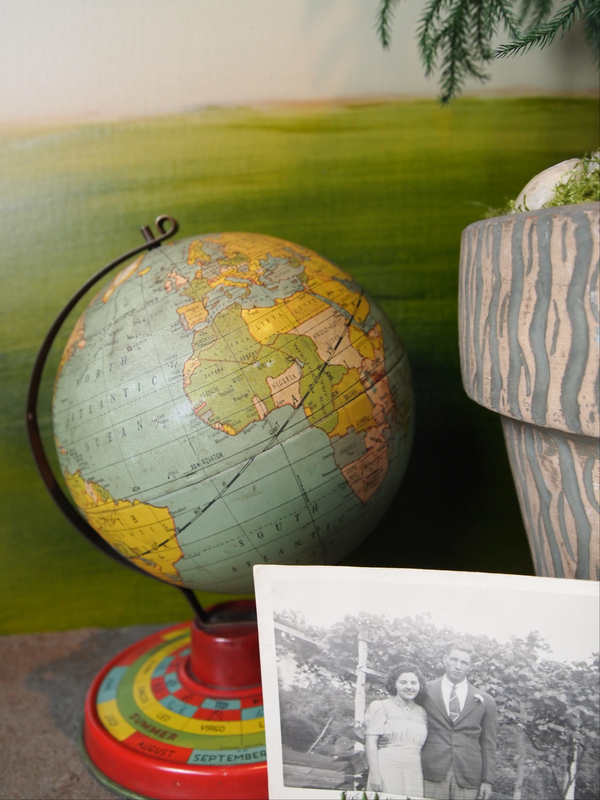 Starting with my globe — yes I LOVE globes and anything map related. My friend Kate is convinced I need to seek help with this particular obsession. This one caught my eye because of its unique zodiac base. I have a collection and some are in good shape and some…not so much. To see a project for those not in good shape, check out my video, A World Of Thanks. Now let’s move on to the green metal flower frog. What can I say, it’s just perfect. It’s green, my favorite color, and I could use if for its original intent or it can hold photos. As you can see, mine is holding a picture of my mom and dad on their wedding day, June 29th, 1940. Even though she has her eyes closed, it’s one of my favorite photos. 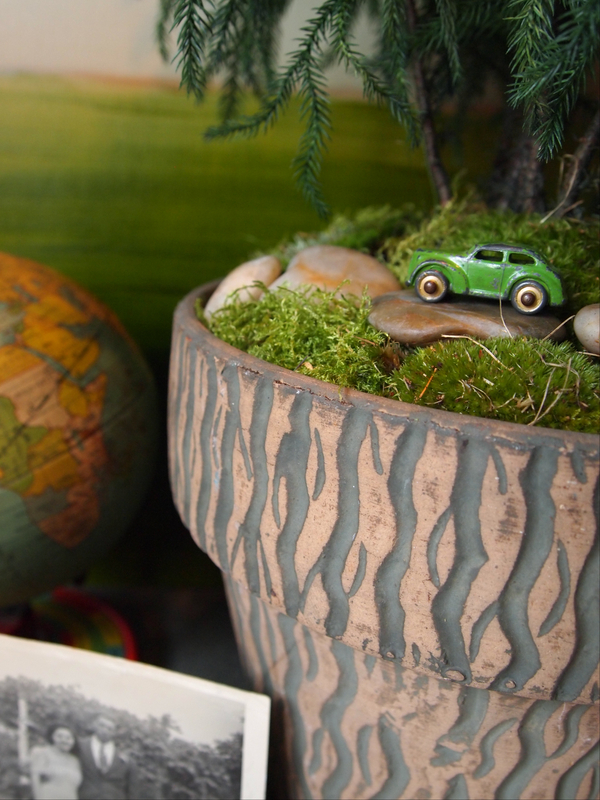 And last but not least, a green vintage metal toy car and an arts and crafts era ceramic planter. My friend Shaina gave me this lovely Norfolk Pine which I repotted into one of my favorite old ceramic pots. I added some moss, small rocks and my little green car. Doesn’t it look like like it’s driving through a redwood forest? Alright, maybe not but I think it looks cool. Busy weeks call for some downtime. A good book, my sketchbook, and a cup of tea or coffee brings me back to earth. 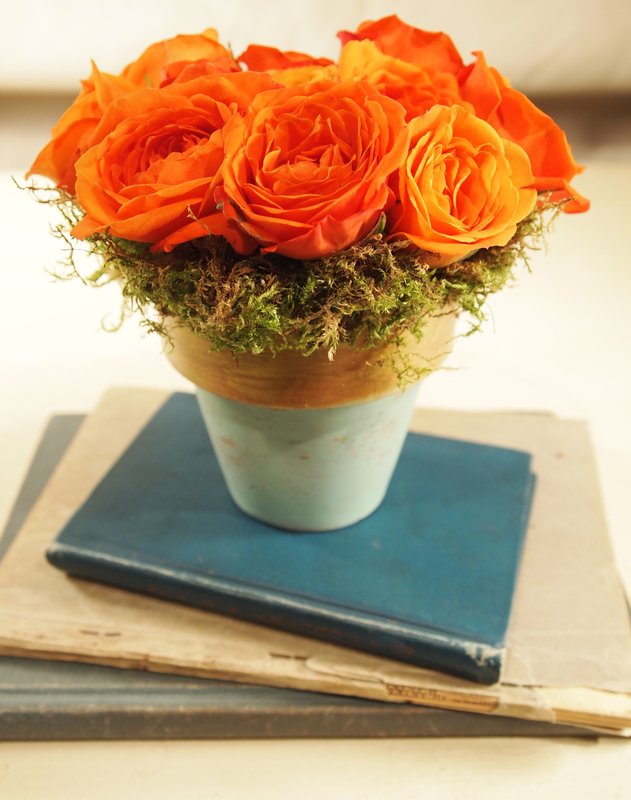 At the grocery store, I picked up these tea roses but instead of plunking them into a vase, I placed them in a small terracotta flower pot. A while back a local greenhouse was throwing out these tiny pots which I rescued and painted with acrylic paint. They look great with any flower and they look great on my desk. Line the pot with a grocery store plastic bag (we all have loads of those), insert floral foam (wet of course), then cut away the excess plastic with a scissors. Now cut and insert the flowers until the entire opening is filled. I tucked moss around the edges to hide any hint of plastic. 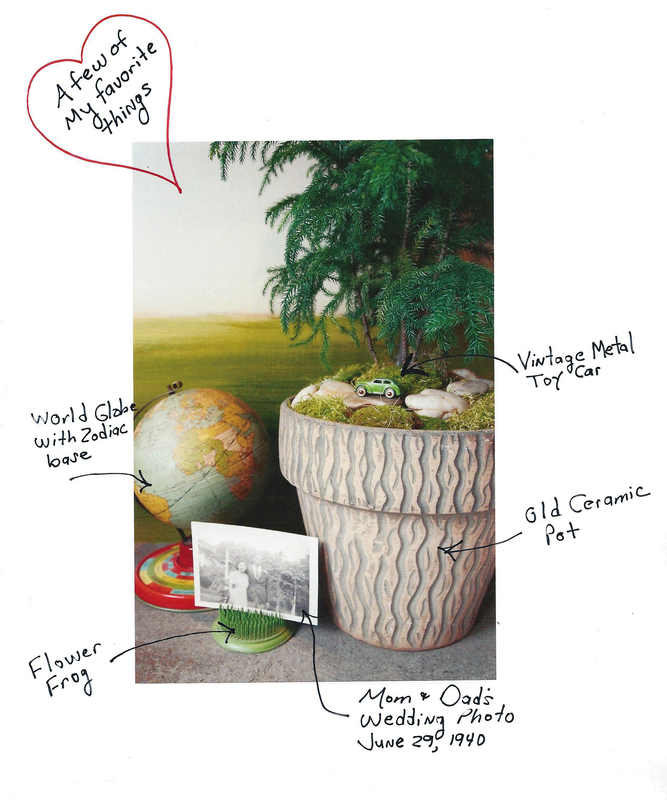 You can find the supplies needed for this project at your local craft or floral shop. And, note to reader, most craft stores have a great selection of small terracotta pots. These would make great place card holders, get-well and birthday gifts, or gifts for other occasions like Valentine’s Day! Hint, hint — THAT day is right around the corner. 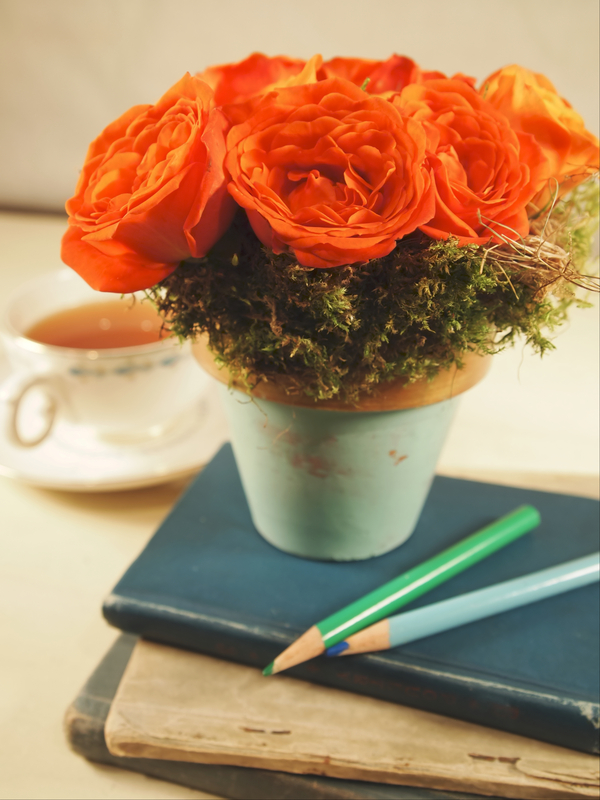 Relax, take time to smell the roses, and happy crafting! This past weekend we packed up the car and off we went to visit my family. Since I hadn’t seen them over the holidays, I wanted to take them a little creation that was easy to make and something they would enjoy for a long time. I found potted Daffodils at a local nursery and knew that was just the ticket but they needed some editing. Did you know that the Daffodil symbolizes rebirth and new beginnings? Daffodils or other early spring bulbs. Baskets. Come on folks admit it, we all have a secret stash of baskets lying around somewhere. Plastic basket liners. Okay, you probably don’t have those but any florist can help you out. Or you could use plain old trash bin liners. Moss – florist or craft supply store. One bag of potting soil which you can find at any florist or nursery. Place a basket liner inside the basket. If you’re using plastic trash bin liners, cut the bin liners to size and place inside the basket. Carefully remove the Daffodils (or bulbs of choice) and the soil from their nursery pots by turning the pot upside down. Be careful that you keep as much soil with the bulbs as possible. Insert the bulbs into a basket. 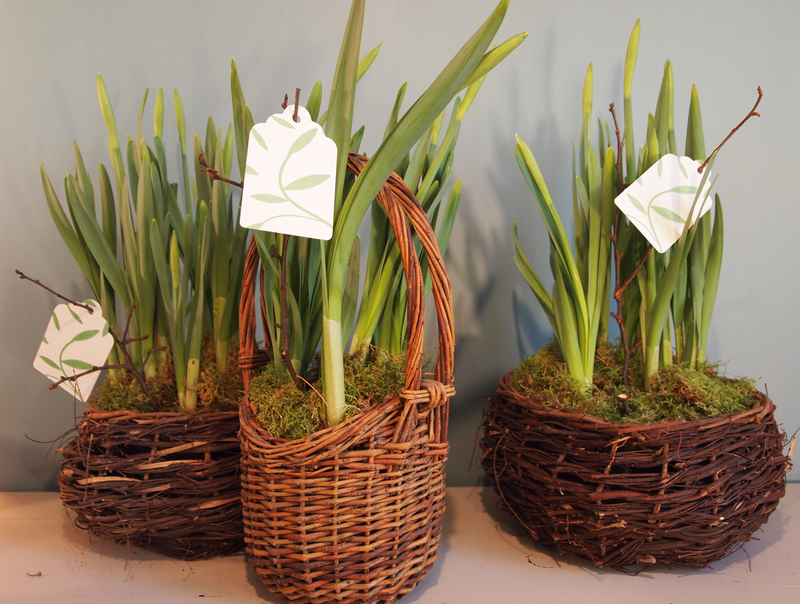 Use potting soil to fill in the space around the bulbs and the basket. Insert some moss over the bulbs to cover the exposed soil. Your done! Seriously, the whole project for three baskets took me about 30 minutes. 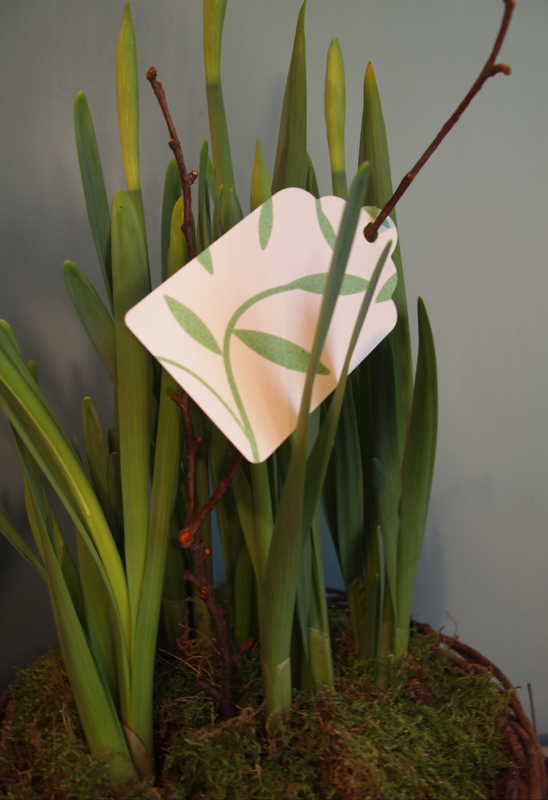 I attached some homemade gift tags to some twigs and out the door we went. The care instructions are easy too. Water when you feel the soil is dry, but don’t over water. Keep them out of direct sunlight and they’ll burst open before you know it. After the flowers have wilted and the greens have browned, simply place the bulbs in the soil outside and next Spring they’ll start their little cycle all over again.